It is a good solution to provide an alternative to Google Maps, with support to use any other Web map tile service. This is good, since Google started to charge for the use of Google Maps above a certain level of usage. To start our interactive map service, we need to setup a basic map. Lets start by downloading the leaflet library. Download the Leaflet 0.7.3 version, as I will use that one in this article. Now upload these files after unzipping them to your web server. Put leaflet.css in css folder, and leaflet.js in js folder. Also put the images in images folder in the js folder, leaflet will look for them there. Create a map instance, and assign it to the 'map' DIV, define it's coordinates to London (51.505, -0.09) and zoom of 13. We define a tile for this map. We are using Mapbox tiles. You can use OpenStreetMap also. We define the maximum zoom as 18. And add it to our map with .addTo(map). In this tutorial I am creating an informative map. We will need some markers to put on the map, a street and an area. Lets start with markers. We will use them to mark some companies. Every company has a name, a description, geographic location and a telephone. You will need to create a database. Then we create a table and name it companies. It will have six columns. It needs the ID field to be of type INT, auto incremental and be the primary key. Then comes the company name in company field with VARCHAR type and 255 characters. The description can be any details about the company, so we use a TEXT field to hold a lot of text. Latitude and longitude are the geographic coordinates of the location on the map. We will get that from the map, so do not worry. Finally the telephone, or you can make it email, is another VARCHAR field to hold that data. Again the ID field of INT type, auto incremental and being the primary key. Every street have a name, so we make a field with VARCHAR type and 255 characters. Finally every street is a line, it has a start and an end, but it is not necessarily a straight line, as we may have some points where the street changes its direction. So we have at least two geographic points on the map, and we have some other points where the street changes its way. I will make a TEXT field to contain all this data. Its structure is the same as streets, but we did not put them together in the same table, as areas are a little bit different than streets. In the future you may want to connect streets with companies, as every company is on a street address. And there may be other reasons why you do not want to do that. One note, an area does not have a start and end point, but it is at least three points, with two points it is a line. When we talk about areas we need three points at least. I am separating every admin operation in a page so you do not get confused with the complexity. Naturally I would make a dashboard and a very complex administration system, but for this article I am doing it in a simple way. For cleaner JS code I will use Jquery. Includes Jquery library. This is our map container. We create a form to send our data via POST method to PHP. This function will create a draggable marker and add it to the map. We instantiate a marker object given a geographical point and some options. map.getCenter() returns the geographical center of the map view. For the syntax details check the Leaflet documentation. We create an event listener on "dragend", collect the latitude and longitude values, assign them back in our HTML. You can grab and drop the marker, it will collect the point in the form. Add a company name, a description and a telephone number. Now lets explain this code. We are including db.php, there we have a DB class for all PHP operations with the database. Now we collect all the data we got from the form with some filtering. We do not need any tags in our data. Do not panic, we are calling a method addCompany from our class connectToDB and passing the variables we have collected. The rest is a regular HTML. To complete the operation we need to create db.php which holds the DB manipulation class, we will add our first method addCompany in it. But first we will create config.php which will hold the DB config variables. I am defining DB constants. Four constants we are using with every connection to MySQL server. "server" is you MySQL server, in my case it is localhost. "dbname" is the DB name of your MySQL Db, "user" is the mysql username and "pass" is mysql password. We are creating a class named as "connectToDB", here we will put all the methods related to the DB. Here we are defining a property which will be used to hold the instance of the mysqli class. This is the constructor method, this will get the config values from "config.php" and initialize new connection to the MySQL DB. This is the destructor method thise will close the mysql connection after all the operations are performed. Make an instance to mysqli using MySQL Improved Extension which allows us to access the functionality provided by MySQL 4.1 and above. We pass our DB constants. Now we have a connection established with the DB. We create a prepared statement to insert our data to the companies table. The question marks are placeholders where we it will bind our variables. Prepared statements secures us from SQL injections. Never use classic statements if you want to write secure Web applications. We bind our variables with bind_param method, they are all strings so for five placeholders we specify five strings as 's', and then pass our variables. Finally we execute our statement. Without this method the query would not be executed. Do not forget to close your statement. Sometimes I forget to do that. It does not cause noticeable problem, but it is always wiser to write clean code. With this we finished adding the company. So let me explain it now for you. When you edit a company you need to get it from the DB first, so we will need to create a method which will get us all the companies from the DB. This is where our method getCompaniesList gets handy. But to use this company we need to include the db.php file in our editcompany.php file, and then call that method. With panTo(), we tell the map to change its center, and we set the latitude and longitude of the marker with setLatLng(). Take care to match variables locations with columns locations in the query. The results are assigned to an array which we finally return it. This function will make a query and update our company we selected in the drop-down list. We are not assigning data from the array to any HTML field, as we do not have them here any way. Put this method in our connectToDB class. In this file we have a lot of new functions, but before getting into them we need to talk about what we need here. When we create a street, we need some way to mark points on the map. We will need a way to draw the street line through the points we marked. We will need to clear the points we drew. We need to be able to delete one point a time if we want and finally we need to be able to collect the geographic locations of all these points. I have created two buttons under the map, one is to draw a street and the other is to clear the map. Another button is in the form under the textarea for collecting points from the map to the textarea. You will notice that every button has an onclick event with a function. Let me go through these functions. But before that let me explain two global variables I will use in these functions, "polyLine" and "draggableStreetMarkers". "polyLine" will hold the poly-line we draw on the map. We need to have access to it from several functions. Next "draggableStreetMarkers" is an array which will hold all our points geographical locations. Every location has two values, latitude and longitude, and a line has several points, so we need an array to hold all these data values, and we need to have access to it from several functions. The first function I'll talk about is the one we call in "Clear map" button. Obviously we use it to clear the map from all the points and lines we put on it. It is named as resetStreet(), and we check if there is a polyLine available and remove it from the map. Then we loop through the draggableStreetMarkers array and check every element which is a marker in this situation. We also remove it from the map and reset draggableStreetMarkers by assigning to it an empty new array. You will notice a method in leaflet called removeLayer. We use it twice here. All elements we put on the map are layers, as like you take a bunch of transparent papers and start lining them one on another, the map works in the same way. In this function we draw a line through the points of a street we want to create. Remove any poly-line we drew before, so we do not have overlapping on the map. Define an array for holding latitude and longitude of every point on the map. Loop through the points in draggableStreetMarkers array. If the element is not empty them push the latitude and longitude values to latLngStreets array as a LatLng pair "a type of data in leaflet". In draggableStreetMarkers we have the elements as markers. We need only the geographical points from them so we use getLatLng() mthod to get it. If we have more than one point on the map we can draw a line. So we create a red line and add it to the map. If the line is created successfully we need to zoom the map so it fits the line we have drawn. This function seems complicated at the first sight, but when you analyze it step by step, you can see it is very logical and simple. In the third button we call getGeoPoints(), with it we get the points from the map and assign them in the text-area box in our HTML. In this function we first create a local array named points. Then we loop through the draggableStreetMarkers array and for each element that is not empty, we extract from it the latitude and longitude, and pair them with a comma between putting the longitude first. For some reason the standard in leaflet is to keep pairs of latitude and longitude values in that order when it is in the string format. Finally we join all the pairs again using commas as separators and assign the big resulting string to our text-area. We saw how to draw a line, how to clear the map and how to get the points data from the map. But do we create points on the map? It is not one draggable marker as in companies. This time we can use an unlimited number of these. We create a mouse listener function on the map. On each right click it gets, it will create a new draggable marker with the geographical point location we clicked on. If we want to remove a marker we have created, we click on the marker and it will be deleted. So when the document is fully loaded and ready, we add a listener "on click" to the map to invoke addMarkerStreetPoint() function with passing e.latlng which represents the points latitude and longitude. In addMarkerStreetPoint function we create a marker with latitude and longitude we have provided, make it draggable and add it to the map. For every marker we assign an ID, so we can find it later in draggableStreetMarkers array. The ID value will be next available number in the array. For deleting the marker by a click on it we add a listener on the marker itself, when triggered we remove the marker from the map and the draggableStreetMarkers array. Finally we add the marker in the draggableStreetMarkers array which holds all the markers we have created. We include our database class because we need to connect to the database and get all the streets by getStreetsList() method. In our HTML form we are now choosing from several streets by a drop-down list. When we select an option from the select we will invoke a trigger which draws that street and assigns its points. When this trigger is invoked first we clean the map with resetStreet();, then loop through our array we got from getStreetsList() method and if there is a match, we assign the geographic points to the text-area and then draw the street. Before drawing we need to convert the raw data from the database to more suitable representation of data to leaflet, so we use arrangePoints() function to which we pass the raw data. arrangePoints() function splits the raw data (comma-sperated points) to array of points. Now we create two local arrays to divide latitudes and longitudes from each other, and loop through then assign them. Now we create a new array and fill it with the points in leaflet "latLng" data representation. Finally we add the points on the map and to draggableStreetMarkers array. Nothing special about this function I already explained a similar one before with companies. It is the same as editstreet.php file, but here we can not edit the street. We just choose it from a drop-down list and can click on button to delete it. It is the same code as in addstreet.php. I have just changed the names of the functions and some variables. The only difference we need to notice is this code. This is the way we create a polygon in leaflet. Like with lines, it receives an array of points and options like color. With this we finished with the updating. By this we have finished the administration. We are back to the front end interface. It is our index.php file. We have finished the administration interface, after filling up the database with markers, streets and areas. Now we want to show them all on the map. Of course this is an interactive map, so when a marker is clicked it must trigger a popup with some information, the same for the street and area. Now when the document is fully loaded, we call three functions: one to add all companies and markers, the second to draw all streets and the third is to draw all the areas on the map. This is what you need to put between script tag in the bottom of the file. In this function we loop through companies array and create a marker for every company. Then bind a popup to every marker with the details of that company. If you click on the marker later a popup with these information will appear. This function will also loop but through areas array. It creates a polygon for every area and bind a popup to it. Do not miss stringToGeoPoints, we will get back to that later. In this function, like with the two previous functions, we loop through streets array and draw a line for every street. Again we are binding a popup with the street also. Finally stringToGeoPoints() function is a helper function. It takes a string with comma separated list of points and convert it to an array of geographic points, which is returned back to the caller. This function is used in addAreas() and addStreets() functions. With this tutorial you have learned how easy it is to create your maps based application using leaflet library, thus without relying on Google Maps. The code was presented in the article in a way to help you understand it without having to go back and forth in the article. 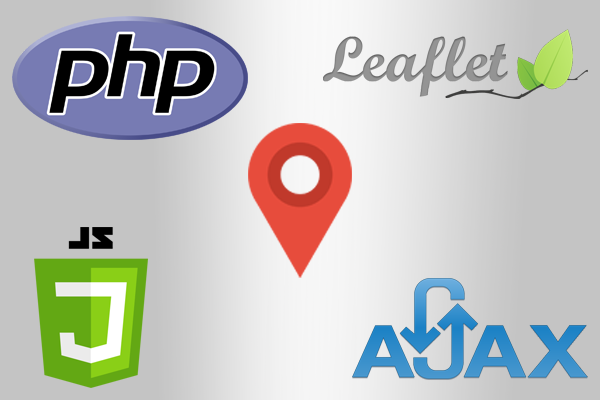 In the next article article I cover how to search for locations in a LeafLet map using AJAX requests. You can download the complete Leaflet PHP MySQL Map package in the ZIP format, or install it using the PHP composer tool with instructions in the same page. If you liked this article, share it with your colleague developers. If you have a question post a comment below.